Sound is all around us. We don’t need any particular talent to use it. Doctors tell us that we can hear sounds in the womb. Using sound well is a different story. Being able to judge sound, to know if it is the best possible for your clients – or at least acceptable – is another different story. For a simple definition, “Sound” is what we hear. But actually every sound involves hundreds of steps. These steps begin with a motion that takes place at one point. We can’t see it, but you can visualize it by thinking about it like a pebble that is thrown into a pond. Quickly, that one motion starts a series of motions that spread out as waves. Like the circular wave on the water, sound is a wave that spreads out from the source. There are some differences with the water analogy though. The first is that we see the pond surface as a flat surface. Our sound wave is different – it goes out in all directions from a speaker. It is similar to the way that a light goes out from a flame – from the top and bottom and all sides at once. The second difference is that the spreading wave, that energy spreading out from the speaker, is pushing on air. Air acts differently than water. But the main thing is true – a wave of sound and a wave on water and a wave of light all carry energy. Eventually the energy of the wave reaches our ears. It then goes inside the ears and finally (through a process that is so sophisticated that it seems like it must be magic), the wave motion turns into electricity. That energy goes down some nerves. That new energy wave of electricity transmits what we heard, that original motion, to the brain for analysis. Sometimes the word Sound and the word “Audio” seem like they mean the same thing. But they can be different. We will say that “audio” is a type of sound that is being played through some equipment. This is the sound that we hear in the movie auditorium. Grammar in English is complicated though, so it is not always true. We will say that the sound of his voice onscreen was pleasant – we won’t say, the ‘audio’ of his voice. And, we won’t say that the voice of the singer on the street had amazing ‘audio’. Instead, we would say that the ‘sound’ of his or her voice was amazing. Whether the sound is natural or reproduced, the path to our ears is complex. You don’t need to know about most of that complexity, just like we don’t need to know about most of the complexity of the sound speaker on the wall. But as a professional-in-training, you should understand enough so that you aren’t fooled by something that isn’t immediately obvious. You should be able to respond correctly if an audience member says something about the sound. For example, you could ask a appropriate question that will give the tech who will repair the problem better information. Because your job is to tell the technician about negative changes in the sound – a rattle, a hum, no sound, distorted sound, sound that isn’t balanced (too much or too little from one side, for example)…and where…and if possible, why. So, we’ll start slow. We’ll cover some basics. And after you hear a test DCP in an auditorium a few times – or 10 or 20 time – you can review the material here to refine your knowledge. Perhaps you will find questions while you work that were presented already, but didn’t seem important before you refined your ability to notice things. And, you can ask questions. Because no one was born with this data, everyone had to learn this. Much of it is new, and all of it has been refined very recently as science and technology has progressed. 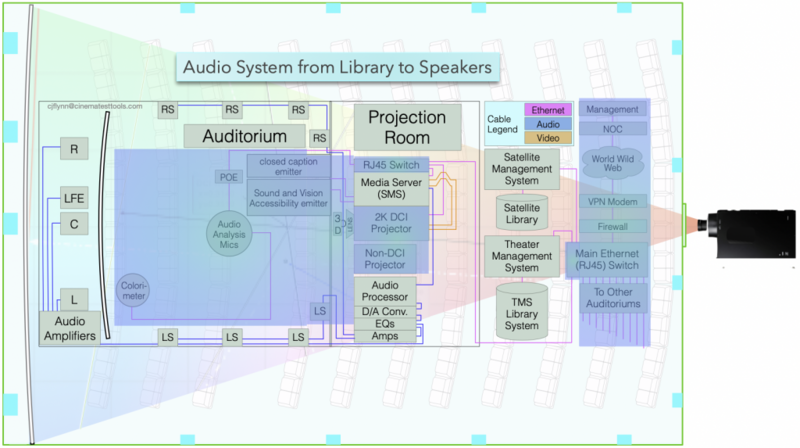 The Auditorium Audio System from the library system to the speakers – Ignore the parts under the purple boxes. The Audio portion of a movie comes out of many speakers around the auditorium. Most of the time there are 3 speakers behind the screen called Left Front (LF), Center Front (CF) and Right Front (RF). Usually those speakers are spread out across the screen, closer to the top than across the middle, and pointed slightly downward toward the center of the room. On the side walls, and the back walls, are the Left Surround and the Right Surround speakers. Finally, there is a speaker (or set of speakers) that handle the extreme low frequencies. These are called the Low Frequency Effect speakers, and abbreviated, LFE. Those 6 sets of speakers (around the room in a circle, LF, CF, RF, RSurr, LSurr and LFE) are called a 5.1 system. In those simple statements there is a lot of unsaid information. For example, when the word speaker is used, it probably means a box, or even two or three boxes. Each box might have 1 or 2 or 3 speakers in them. Why are there different designs? The first answer is that common situation: Compromise. The movie shows different kinds of scenes. Big open spaces, small tight spaces. Places without echo, places with an echo when people talk. We don’t think about it, but we would notice that a room sounds weird if it had no echo. A movie theater has to make both those kinds of sounds, and many others. Loud, soft, surprising loud~! Conversation and war sounds. Crying during war sounds. It is all very difficult to do, and each size of auditorium is different. The seats can affect the sound, the number of people wearing heavy jackets make the sound act differently. Before we go onto Part 2 of Audio Basics (Sound), take a break from study for a week. Become aware of your perception of sounds. Listen to the background sounds. Listen for the difference between sounds that bother you and sounds that are pleasing. Remember that they are all waves, coming from a source, and that some of those waves are coming directly and some are bouncing off of walls and ceilings – but our ears and brain put them all together naturally.